The cucumber (Cucumis sativus) is a widely cultivated plant in the gourd family Cucurbitaceae, which includes squash, and in the same genus as the muskmelon. The English word cucumber originated from Indian word “kachumbar”(कचुँबर) and in Urdu we say “Kheera”. The cucumber is a creeping vine that roots in the ground and grows up trellises or other supporting frames, wrapping around ribbing with thin, spiraling tendrils. The plant has large leaves that form a canopy over the fruit. The fruit is roughly cylindrical, elongated, with tapered ends, and may be as large as 60 cm long and 10 cm in diameter. Cucumbers grown to be eaten fresh (called slicers) and those intended for pickling (called picklers) are similar. 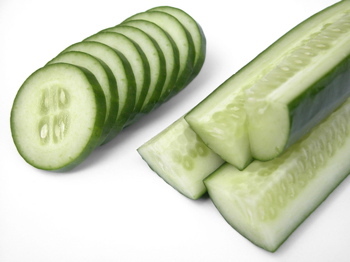 Cucumbers are mainly eaten in the unripe green form. The ripe yellow form normally becomes too bitter and sour. Having an enclosed seed and developing from a flower, cucumbers are scientifically classified as fruits. Much like tomatoes and squash, however, their sour-bitter flavor contributes to cucumbers being perceived, prepared and eaten as vegetables, which is the accepted culinary term. A few varieties of cucumber are parthenocarpic, the blossoms creating seedless fruit without pollination. Pollination for these varieties degrades the quality. In the US, these are usually grown in greenhouses, where bees are excluded. In Europe, they are grown outdoors in some regions, and bees are excluded from these areas. Most cucumber varieties, however, are seeded and require pollination. Thousands of hives of honey bees are annually carried to cucumber fields just before bloom for this purpose. Cucumbers may also be pollinated by bumblebees and several other bee species. Symptoms of inadequate pollination include fruit abortion and misshapen fruit. Partially pollinated flowers may develop fruit which are green and develop normally near the stem end, but pale yellow and withered at the blossom end. Traditional varieties produce male blossoms first, then female, in about equivalent numbers. New gynoecious hybrid cultivars produce almost all female blossoms. However, since these varieties do not provide pollen, they must have interplanted a pollenizer variety and the number of beehives per unit area is increased. Insecticide applications for insect pests must be done very carefully to avoid killing off the insect pollinators. There appears to be variability in the human olfactory response to cucumbers, with the majority of people reporting a mild, almost watery flavor or a light melon taste, while a small but vocal minority report a highly repugnant taste, some say almost perfume-like. The presence of the organic compound phenylthiocarbamide is believed to cause the bitter taste. Cucumbers can be pickled for flavor and longer shelf life. As compared to eating cucumbers, pickling cucumbers tend to be shorter, thicker, less regularly-shaped, and have bumpy skin with tiny white- or black-dotted spines. They are never waxed. Color can vary from creamy yellow to pale or dark green. Pickling cucumbers are sometimes sold fresh as “Kirby” or “Liberty” cucumbers. The pickling process removes or degrades much of the nutrient content, especially that of vitamin C. Pickled cucumbers are soaked in brine or a combination of vinegar and brine, although not vinegar alone, often along with various spices. Pickled cucumbers are often referred to simply as “pickles” in the U.S. or “Gherkins” or “Wallies” in the U.K, the latter name being more common in the north of England where it refers to the large vinegar-pickled cucumbers commonly sold in fish & chip shops. (Although the gherkin is of the same species as the cucumber it is of a completely different cultivar). In the United States, consumption of pickles has been slowing, while consumption of fresh cucumbers is rising. In 1999, the consumption in the U.S. totalled 3 billion pounds of pickles with 171,000 acres (690 km2) of production across 6,822 farms and an average farm value of $452 million. According to FAO, China produced at least 60% of the global output of cucumber and gherkin in 2005, followed at a distance by Turkey, Russia, Iran and the United States. The usual commercial method of cultivating cucumbers involves the use of mineral (manufactured) fertiliser. However, a study in 2004 in Finland by the Department of Environmental Sciences at the University of Kuopio (Helvi Heinonen-Tanski, Annalena Sjöblom, Helena Fabritius and Päivi Karinen) showed that pure human urine can be used as more than just a substitute. Crop yields compared favorably, and taste and microorganism content did not appear to be negatively affected.